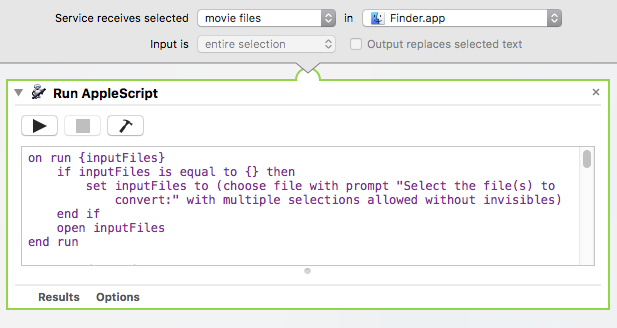 How can I either use applescript or Automator to batch export video files I have selected in Finder, but NOT using the "Encode Selected Video Files" service method, which only has 4 formats to choose from? Basically, I need to export the videos either using the "Most Recent Settings" chosen the last time I exported a video from QuickTime 7, or to have some option to specify the settings using the export dialog in QuickTime 7 to choose the specific formatting I need for the videos I have selected. Sometimes I need the codec to be "Apple ProRes 422 LT", and other times I need to use the regular "Apple ProRes 422". I'll also need to ensure the framerate is set to 30 regardless of the source file framerate, and the dimensions will either be 1280x720 or 1920x1080. Lastly, I will also need to set different options for the audio encoding for different videos. Hopefully someone knows a way to do this. I've been digging around here and on Google, and haven't been able to figure it out. It seems most of the info I'm finding online is just telling people how to use the same method, which is using the "Encode Selected Video Files" service. Eureka! I found an Automator workflow online that actually works. I just had to modify it to take movie files as input instead of images. It uses the "Most Recent Settings" in QuickTime 7, so I just need to export the first video manually to get the settings entered properly, and the rest I can just select and batch. Hooray! I will add the script here as well in case the page I linked ever disappears. This just needs to be added in Automator as a service, with movie files from Finder as the input. And here's the AppleScript to add to the service. I just saved the service as "Export_mov_via_QuickTime7.workflow". display dialog "Most recent QuickTime 7 export settings will be used. Existing files will be overwritten/moved to trash! Beware of evil QT7 Gamma shift!" quit application "QuickTime Player 7"
Not the answer you're looking for? Browse other questions tagged macos batch applescript automator quicktime or ask your own question. How to crop Screen Recordings under Snow Leopard? Can I create a service in Automator that will run without having a file selected?